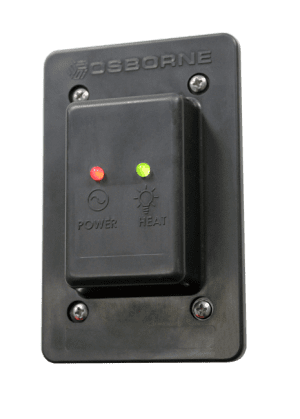 Osborne’s new Heat Pad Indicator Light provides the visual confirmation you need to ensure pig heating pads are providing heat for newborn piglets in farrowing nursery rooms. The product has two lights; one is a bright red LED that indicates proper operation of the electrical circuit while a bright green LED light indicates that the heat pad is drawing power and providing heat. This product is fire-retardant and in a water-resistant enclosure. Shop or learn more by clicking product image below.